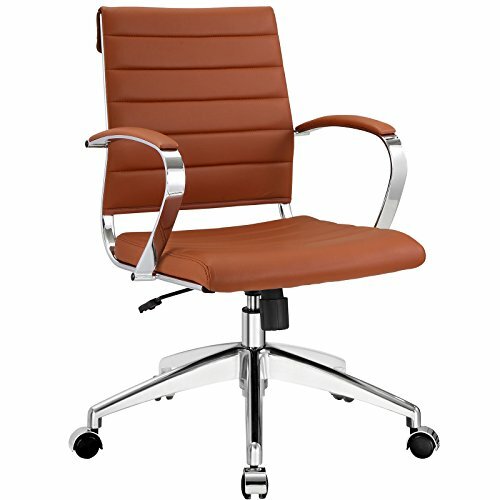 ERGONOMIC SUPPORT - Enjoy reliable comfort with a thoughtfully designed modern executive chair with ribbed sling seating. Experience ergonomic lumbar support while going about your office tasks. VIVID COLORS - Jive is the go-to cool desk chair. Have fun with while seated in an orange, green or red office chair; or liven up the office with sleek white, black, gray, brown or terracotta. CHAIR MEASUREMENTS - 22.5"L x 26"W x 35 - 37.5"H; Seat Dimensions: 19.5"L x 19.5"W; Backrest: 17.5"W x 18"H; Armrest Height from Seat: 8"H; Maximum Weight Capacity: 330 lbs.